Stationary MT monitoring systems have been installed in Japan since April of 1996, providing a continuous recording of MT signals at the Mizusawa Geodetic Observatory and the Esahi Station of the Geographical Survey Institute of Japan. Earthquakes are often dangerous and costly, killing hundreds of people and destroying millions of dollars of property. By evaluating MT data over several years, the GSIJ hopes to be able to better understand why and when earthquakes happen. Eventually, this sort of research may allow an earthquake warning system to be created, helping to prevent some of the loss of life caused by earthquakes. The image above shows pseudosections over time from the Sawauchi research site. The figure on the left covers the period from May to August, 2008; the figure on the right is a subset, from August 11 to 23, 2008. 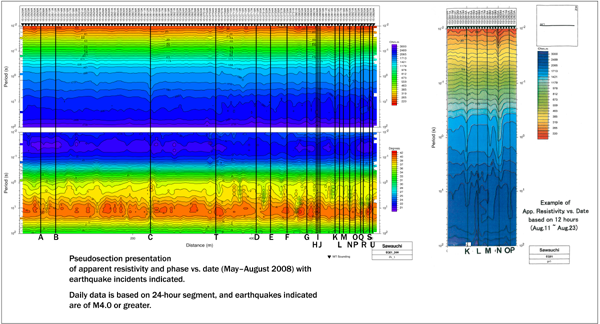 Significant earthquakes (M>4.0) are indicated by vertical lines and letters. This image can be downloaded as a high resolution PDF file (4 MB). More information is available in a short report by senior geophysicist Mitsuru Yamashita. The journal of Terrestrial, Atmospheric and Oceanic Sciences (TAO, Chinese Geoscience Union) published ULF Geomagnetic Changes Associated with Large Earthquakes by K. Hattori in 2004.